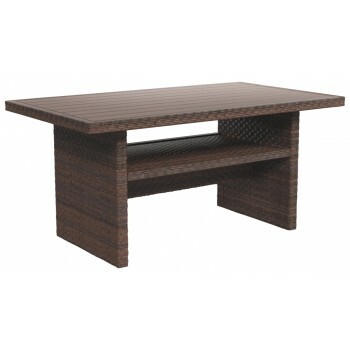 The Salceda multi-purpose coffee/dining table has the smoothly woven wicker lines you love with added versatility. Because the table has a height of typical dining tables, you won't have to bend over to reach for drinks—making it perfect for eating or playing games while you lounge. The planked top looks like wood but is actually water- and stain-resistant resin. Concealed aluminum frame is powdercoated for seasons of carefree use.